One of the great things about 12inch vinyl as opposed to CDs was that there was a superb area on the rather large sleeves for powerful images and way back then a great Album cover could really add real flavour to the music inside…….far more so than the much smaller cassettes and CD packaging that followed. 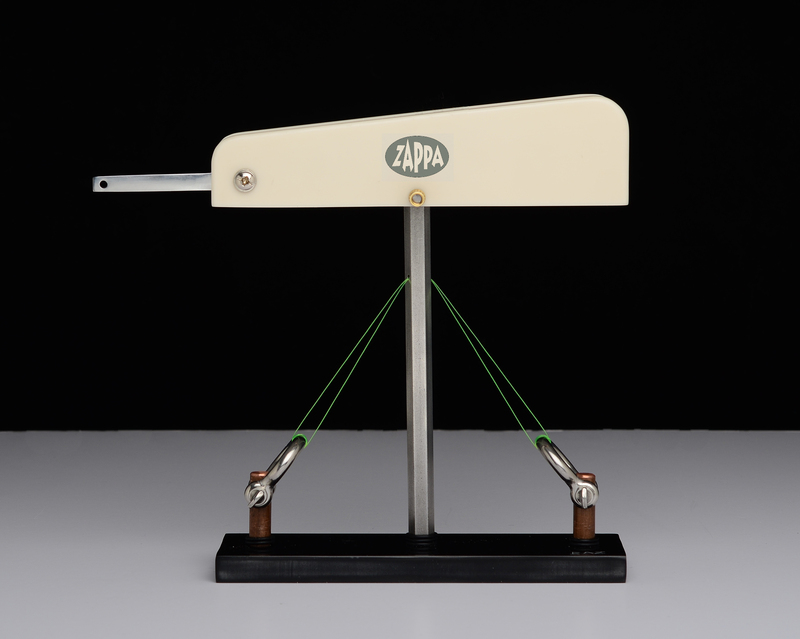 Back around the late 60s Frank Zappa contacted the artist Neon Park to discuss the cover for a forthcoming album. 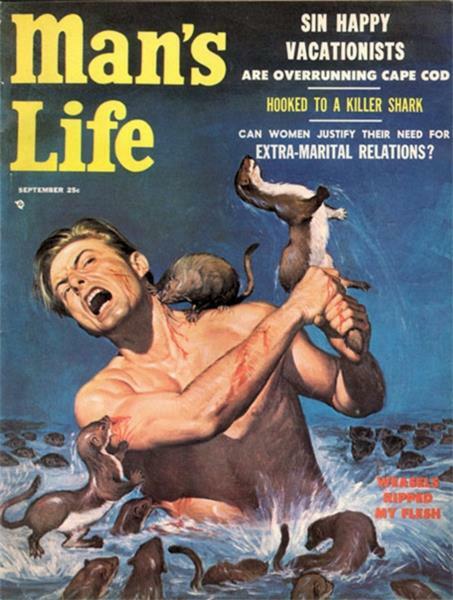 Zappa had found a copy of a 1956 magazine called Man’s Life and was rather taken by the cover illustration for a story called “Weasels Ripped my Flesh” He asked Park if he could develop the idea as he was going to use the magazine story title as the name for his forthcoming album. 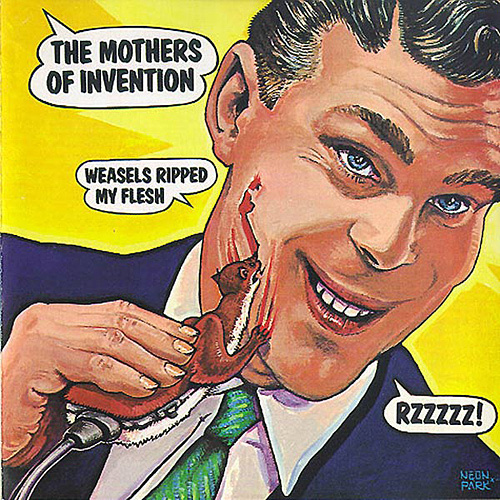 Park then went away and illustrated his version of Weasels Ripped my Flesh and created what still is one of my favourite Album covers of all time. When I first saw it as an Art student I loved the album name and I loved the illustration…The Album was released in 1970. Though it’s not my favourite Zappa music……… the “Hot Rats” album still gets most plays but “Weasels” is for me by far the best Zappa record sleeve. Park who’s real name was Martin Muller went on to have an illustrious career as an artist and illustrator producing work for Little Feat, David Bowie, Dr.John the Beach Boys and lots of superb work in other genres. I dug out ” Weasels” the other day and sporting a smile as big as the guy on the cover I wondered what the illustration would look like with a weasel cut throat razor rather than an electric one. 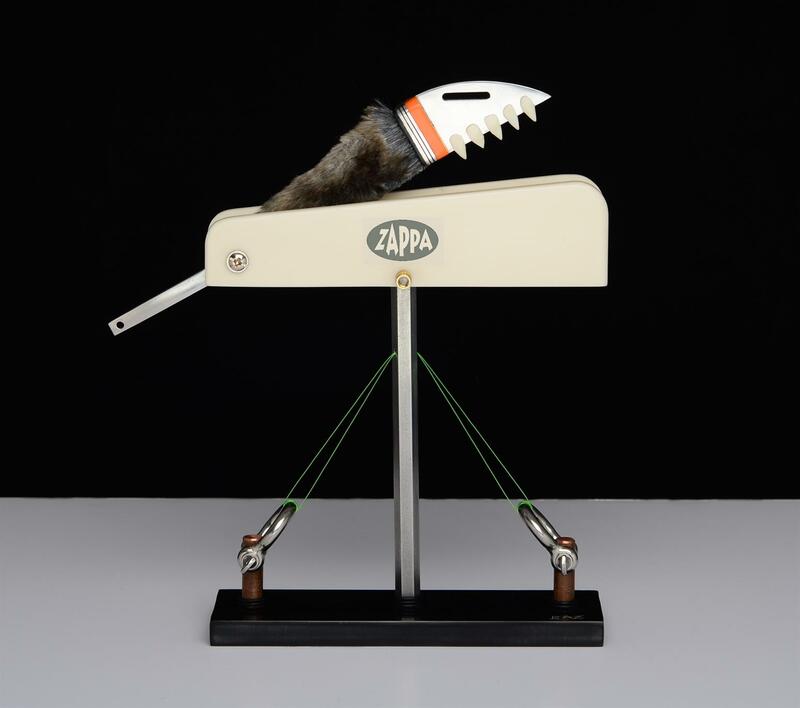 So going back to my creative method of overlaying knife ideas with other stimulating things…this one was obvious and rather simple..the creative light bulb lit up almost instantly .Substitute the electric weasel razor with a weasel traditional razor…it had to be a cut-throat . I decided I had to make it . The album and cover had always meant a lot to me…so in a small way this is an homage to two of my heroes. Both Zappa and Park are no longer with us…….both died in 1993…….but if they are up there looking down I hope they like it. ~ by barrysalter on April 8, 2013.
in 48hrs….One guy has the Neon “Weasels” cover on his favourite T shirt.